The North Shore or north of Boston area of Massachusetts is home to many of the state’s most haunting attractions. In 1692, the infamous Salem witch hunt took place in Salem, Mass. Today, the mystique of those times is still in the air. The Salem Wax Museum of Witches & Seafarers will captivate you. The resemblances are so real, you’re bound to be spooked for days. The Tsongas Arena, located in Lowell, MA, offers sporting events, concerts and family shows depending on the day. 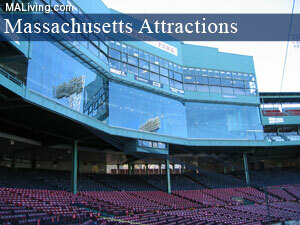 Contact us to feature your Massachusetts attraction in MALiving – Massachusetts Internet Magazine. Learn more about advertising in MALiving.com. Salem Willows is a seaside side park that offers arcades, rides, food and many more activities. A museum that showcases Greek, Viking and Egyptian mythical creatures. Ph: 978 848-6900Tsongas Arena is the home to Lowell Devils hockey team, it also hosts family events and concerts. A museum that has life size wax figures of the witches and characters that were a part of the famous Salem witch hunt. A coastal state park that offers beautiful views and stunning nature trails. This park is open year round. Local art work and sculptures displayed in a scenic garden. Wolf Hollow offers a rare opportunity to view gray wolves in as natural a setting as possible. A house in Salem, MA with 7 gables, that was the inspiration for a book written by Nathaniel Hawthorne, The House of The Seven Gables. This house is now a museum that offers tours. This is the oldest surviving 17th century wooden mansion in New England which was built in 1668. Preserves, celebrates, and interprets historic and contemporary American quilting. The Essex Shipbuilding Museum shares the story of a quaint New England village that built more two-masted wooden fishing schooners than any other place in the world.